Create a new contemporary look for your bathroom with the Aston Langham 60 in. x 32 in x 75 in. Completely Frameless Sliding Shower Door. Accentuated with either chrome or stainless steel finished hardware, thick premium 3/8 in. (10mm) ANSI certified clear tempered glass and deluxe full-length seal strips to prevent leakage; this European-inspired, luxurious door instantly creates a sophisticated custom-look style for your bath at a fraction of the cost. Perfect for that larger alcove space in your bathroom. All installation hardware is included. 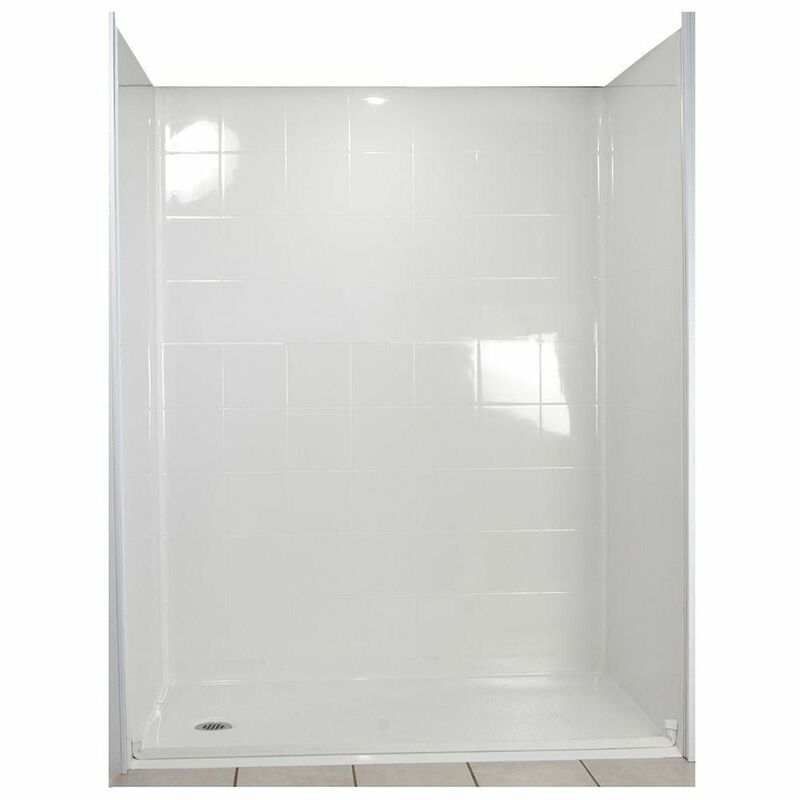 This model is engineered for both right and left handed door installation, and includes the matching 2.5" low profile acrylic shower base, middle drain. Standard 33 1/2-Inch x 60-Inch x 77 1/2-Inch 5-Piece Barrier Free Roll In Shower Stall in White The Ella Standard, (5-Piece) 60 in. x 33-3/4 in. Roll in Shower is manufactured using premium marine grade gel coat fibreglass which creates a smooth, beautiful, long lasting surface with anti-slip textured shower base floor. Ella Standard Barrier Free Shower walls are reinforced with plywood and steel providing flexibility for seat and grab bar installation at needed height for any size bather. The integral self-locking aluminum Pin and Slot System allows the shower walls and the pre-leveled shower base to be conveniently installed from the front. Premium quality material, no need for drywall or extra studs for fixture support, 30 Year Limited Lifetime Warranty (on shower panels) and ease of installation make Ella Barrier Free Showers the best option in the industry for your bathtub replacement or modification needs. Made in U.S.A. For more info call 800-480-6850.